I'm in the town of Bland, VA... which, believe it or not, is a place. I planned this stop so soon after Pearisburg so I wouldn't have to carry six days of food. Especially since the weight loss over the past couple months has caused me to carry more food per day. As it happens, carrying a 30 pound backpack up and down mountains for 20 miles every day is one hell of a calorie burner. I looked over the menu on the wall, behind the girl in a blue and black Dairy Queen uniform, trying to decide which was the most calorie filled snack. "I'll have the Turtle Waffle Bowl Sundae." Simply saying those words outloud made me feel twenty pounds heavier. 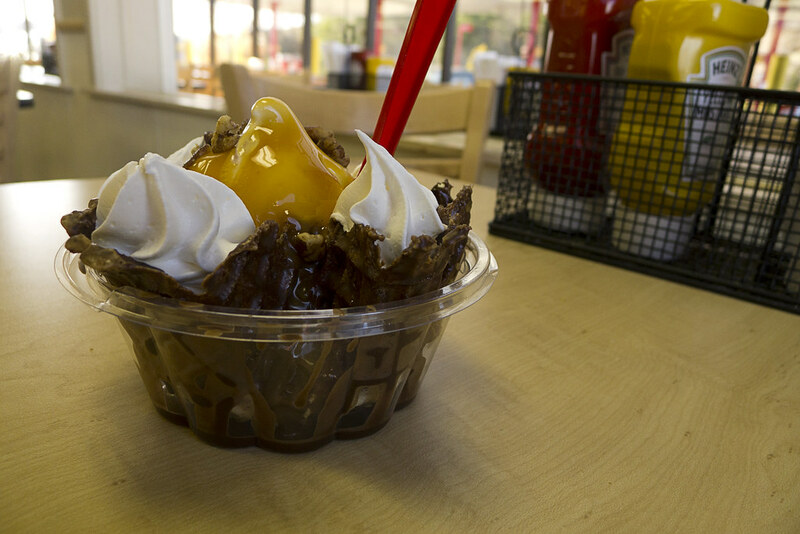 "Would you like the waffle bowl dipped in chocolate?" she asked. "Sure," I said, almost shamefully, "Why not?" It's much smaller in reality than the menu photo suggested. Even still, I'm finding it hard to finish the caramel, whipped cream, and melted ice cream that has puddled in the bottom. Uhh, now I'm craving healthy food and that's no good.